Jazz, classical, Scottish and world music – it’s all in our 2018 Festival Fringe programme. More of a book person? Come and hear James Naughtie and Bernard McLaverty in conversation with international mezzo-soprano Andrea Baker on the music that has shaped them. 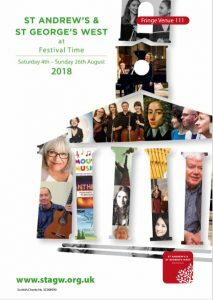 You can download a copy of our 2018 Festival Fringe brochure here or pop into the church in George Street and pick up a copy. Our festival box office opens at the church on Monday 6th August, but you can get tickets now through the Fringe. Here’s the link to the Fringe page for St Andrew’s and St George’s West – we’re venue 111. Happy browsing and see you in August!